from The Parkland Worker on Vimeo. Peter Maurin condemned the fact that people made their living by machine (…ironically only to most-desire goods that were made by hand). 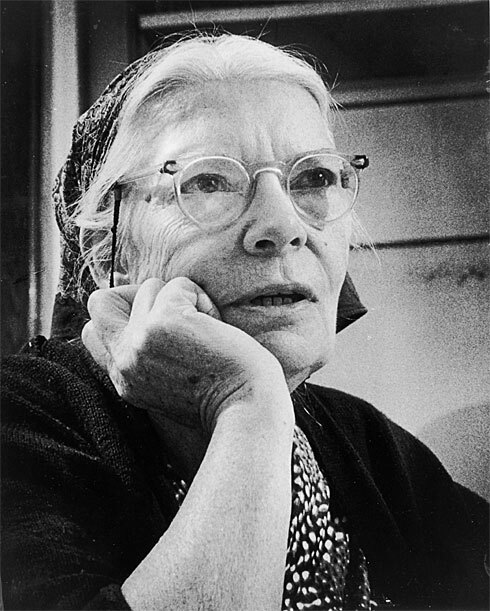 Dorothy Day quipped that if she had a good car she’d be on the road always. How did these two ever get along? When I served a church on the East Coast of the USA many of the parishioners had been employed by the Draper Corporation in Hopedale, MA. They made the best power looms in the northeastern United States. The factory had long been closed by the time we moved there. Interestingly, Hopedale had been founded in 1842 as a utopian socialist commune. The first time I went to visit those who lived there, they each walked me across the village where we strolled the grounds surrounding the factory as they described the life that once had united the people there, both the original inhabitants and later the evolution of the loom by Draper, a busy-fingered farmer, and then the factory workers. We have a Draper Model D loom. We bought it for weaving blankets for those who are without blankets. Clothing the naked. Or more specifically in this case, giving warmth to the cold, the elderly, the ill, and the sleeping. Blankets are one of the most comforting pieces of ‘clothing’ we can think of. There is nothing like a good blanket when you are sick or on a cold night. It is strange to have such a machine as Catholic Workers…just as strange as Hopedale’s history, that the factory that supplied the powerhouses that short-circuited the web of social life in the industrial revolution arose in an actual geography that was devoted to people’s deepest desire to form a genuine community. As hand weavers there is no doubt that a mechanized loom can produce a pattern more uniform than what can be done by hand. That’s not the point of hand weaving. Of course before the age of power looms perhaps there was some weight given to producing a flawless pattern by hand. But really, what’s the point any more? I received Lili Blumenau’s book the other day, The Art And Craft Of Hand Weaving, reviewed by Dorothy Day in 1956. I am not disappointed. She writes, [t]he ideal of handwaving today is not simply material. It is a means of self-realization and fulfillment. And its purpose today is unique. Practically, we do not need to weave cloth by hand but the value of weaving is in the work. The present-day desire to weave is one expression of the search in our time for human qualities. Rather than having written simply another technical book on weaving, Blumenau encourages creative artisanship based on the raw material, its visual and tactile characteristics. And she reminds her readers that this is not the sole possession of only specialty artists. This for her is ‘good work’, engaging, fully human, life giving in every respect. There is admittedly great irony in this loom’s presence on a Catholic Worker farm. In one sense it is as Peter Maurin claims, a machine demeaning to the human soul, emerging as it did as the very workhorse of Yankee (people who live in the northeastern USA) industrialization and the destruction of the rural and urban social tableaus. (Boooo, hiss.) But now the irony, nearly a hundred years following its assembly, this loom has come to demand something of artisanship just to make it work. And more than that, looms like this are now becoming more and more in demand by fibre artists who realize that it is only one more tool in the loom shed for making something distinctly distinct when it comes to doing something more with yarn than that of simply making cloth. And it is good work indeed in both the sense of just making the damn thing run, and of providing another element by craft (rather than by donations from WalMart) for people who are in a very real sense naked without a blanket. When is simple simple enough? We think that all of these forms of weaving are…everything from finger weaving to the power loom. You know, it is quite possible to hold two opposing thoughts in your head at the same time without your brains exploding. It is possible to weave both on a hand loom and on a power loom and practise your craft, and find good work, and perform the Works of Mercy at the same time. The farming commune was a program people longed for and continued to be longed for, so why did it keep failing? Stanley said that all Catholic Worker farms become houses of hospitality on the land. Sometimes, he said, they are a retreat house, a place for alcoholics to dry out, a recreation centre, a home for the mentally ill. No farm could exist the way the Catholic Worker farms do… The Worker, Stanley said, had its high ideals, but at the same time it never let them interfere with the reality of the present moment.